The signing of Auston Matthews to a five-year contract likely will change the landscape of future deals for star players. 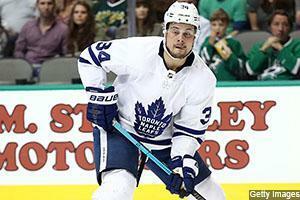 The Maple Leafs gave Matthews the five-year deal worth $58.17 million and bought out one year of free agency. In return, Matthews will make $750,000 in each of the next five seasons starting in 2019-20 but get the rest in bonuses, including $15 million in each of the next two seasons. That makes the deal lockout and strike-proof (assuming the players and owners aren’t stalemated for over a year), something the NHL head office won’t like but the NHLPA will love. Matthews has set the new standard for players and it should be interesting to see what RFA’s like Mikko Rantanen, Mitch Marner, Matthew Tkachuk, Patrik Laine etc. get. Anaheim, Florida, Minnesota, Pittsburgh, Tampa Bay, Vegas and Winnipeg play three games at home. Calgary, Dallas, Edmonton, Montreal, New Jersey, the New York Rangers, St. Louis, Toronto, Vancouver and Washington play three games on the road this week. John Gibson was considered a leading candidate for the Vezina Trophy just a couple of weeks ago. No more. Heading into action on Thursday, Gibson had been pulled in three straight games, giving up 16 goals on 80 shots in 114 minutes (less than two full games) and is 17-19-8 with a 2.93 GAA this season and even though he held the Ducks in playoff contention, the amount of rubber he has seen thus far must be getting to him. He was taken out again on Thursday (the fourth straight game) but this time it was due to injury. Ryan Getzlaf scored on Tuesday and it was his first goal in nine games. He has 11 goals and 34 points in 48 games and has a minus-17 rating, the worst of his career. The Ducks have the NHL’s worst goal differential at minus-51. The Coyotes are trying to hang around a playoff spot and they have 51 points which puts them in a tie for 11th place in the West, but only three points out of the second wild card. It’s hard to believe that the NHL’s Coyotes have played 54 games and they still don’t have anyone with at least 12 goals. An optimist would say that their scoring has been spread around but the truth is that they need a few goal scorers. Brad Richardson who has missed the last 11 games, is still tied for the team lead with 11 goals, along with Conor Garland, Derek Stepan, Christian Fischer and Clayton Keller. Darcy Kuemper returned to action Thursday after missing a game with an upper-body injury. The Bruins are headed for the West Coast this week with games against Anaheim and Los Angeles. Tuukka Rask has been great of late with an 8-0-2 mark in his last 10 games and is 16-8-4 this year with a 2.30 GAA and a .924 save percentage. Torey Krug has five goals and 36 points in 43 games this season including a goal and seven points in his last eight games. After back-to-back 85-point seasons (albeit in only 68 games last season) Brad Marchand is poised to smash that mark this season with 61 points in 53 games thus far. Toss in 82 penalty minutes and 24 power play points and you can see why Marchand is a top-three fantasy player in traditional leagues. Jeff Skinner scored a pair of goals Thursday to give him 33 this season and only four away from equaling his career best. The best time to do so is in a contract year and that is exactly what is happening for Skinner. Sam Reinhart has only 13 goals but does have 49 points in 53 games and is only one point away from tying his career high set last season with 50 points. He still has 29 games left in the season. Jack Eichel leads the team with 57 points including 40 helpers. I’m still so impressed with the season of rookie defenseman Rasmus Dahlin. He has six goals and 29 point with a plus-six rating as an 18-year-old defenseman. He is going to be a star in this league for a long, long time. It was not the best of nights Thursday for David Rittich as he was pulled after giving up two goals on six shots in 14 minutes of action. T.J. Brodie has been hot of late with nine points in his last six games. Travis Hamonic returned to action Thursday after recovering from a lower-body injury. Mark Giordano is also hot of late with 15 points in his last 11 contests and has 54 points in 52 games, only two points away from tying his career high set three seasons ago. There is still a third of the season remaining. He also has three shorthanded goals, a gaudy total for a defenseman. Derek Ryan is on a three-game points streak. Ryan, Noah Hanifin and Elias Lindholm all scored once in their return to Carolina for the first time since their trade/leaving via free agency. Teuvo Teravainen is quietly having a very good season for the Hurricanes as he has 14 goals and 48 points in 54 contests, including four goals and 10 points in his last seven games. He had a career high 64 points last season and is poised to break that mark this season. Micheal Ferland is likely a candidate to be traded by the deadline as he can become a UFA at the end of the season. Lots of playoff bound teams should be interested in the winger’s services as he can score on a top-two line and is feisty. Jaccob Slavin continues to lead all Carolina defensemen in points with 25, four better than Dougie Hamilton. Seven Hurricane forwards have at least a dozen goals, led by Sebastian Aho who has 24. Dylan Strome is starting to show why he was good enough to be selected third overall in the terrific 2015 draft as he has three goals and 13 points in his last eight games. The talented center was picked up along with Brendan Perlini from Arizona for Nick Schmaltz earlier in the season and is thriving in Chicago with 23 points in 29 contests. Erik Gustafsson continues to head up the Chicago blueline offensively as he has 11 goals and 34 points in 52 games. Gustafsson has three goals in his last three games with two coming on the power play. Collin Delia has been giving a clinic in the Chicago cage as he is 6-2-3 with a 2.98 GAA and a .923 save percentage. Alex DeBrincat has a seven-game points streak in which he has 12 points. He has 28 goals and 50 points in 55 games thus far. The Avalanche continue to slump as they are now out of a playoff spot after going 2-7-1 in their last ten games. After splitting up their big three, the Avs reunited Gabriel Landeskog with Nathan MacKinnon and Mikko Rantanen this week. Semyon Varlamov is 13-13-6 with a 2.92 GAA and a .905 save percentage and that is better than backup’s Philipp Grubauer’s 9-7-3 with a 3.47 GAA and a .890 save percentage. The Avs have given up 12 empty net goals this season. The Avalanche are led offensively by the big line with Landeskog leading with 29, while MacKinnon has 28 and Rantanen 24. Carl Soderberg is next with 17 and Colin Wilson and J.T. Compher have 10 each. The big talk as always out of Columbus is the status of Artemi Panarin and Sergei Bobrovsky, both UFAs to be at the end of the season. With the NHL trade deadline just 17 days away, look for the Blue Jackets to deal both and get some assets back, rather than just lose them at the end of the season. Panarin saw his five-game points streak end on Thursday but he still has 60 points including 20 goals in 51 games. Bobrovsky is not having a good season with a 21-16-1 record to go with a 2.98 GAA and a .902 save percentage. Seth Jones leads the Blue Jacket blueliners with 33 points. Zach Werenski has nine goals and 28 points but has not been as good as he was in his rookie campaign two seasons ago when he had 47 points. Ben Bishop is day-to-day with an undisclosed injury. He missed Thursday’s game and the hope is that he is able to return Saturday. Tyler Seguin leads the team in shots on goal with 214 and then there are three players in the 120’s as Jamie Benn has 129, Alexander Radulov has 125 and rookie defenseman Miro Heiskanen has 123. No other Star is in triple digits. Valeri Nichushkin has yet to score in 39 games. I guess that would be okay if he was a goalie but Nichushkin was drafted 10th overall in 2013 and the winger scored 23 goals in 166 games as an 18, 19 and 20-year-old in the NHL before he bolted to the KHL the last two seasons. Brett Ritchie did not face any supplemental discipline for boarding Alex Goligoski Monday, a misdeed that cost him a five major and a game misconduct. Detroit plays three games in four nights as part of a four-game week, so Jimmy Howard should get three starts with Jonathan Bernier playing once. The Red Wings also play a home-and-home series against Philadelphia this week and expect to see Danny DeKeyser add to his limited penalty minute count if there is any rough stuff. Dylan Larkin returned to action on Thursday after missing a game with an oblique injury and had a couple of assists to give him 51 points this season. Michael Rasmussen returned to action Thursday after missing 10 games with a hamstring injury. He celebrated with a goal and an assist to give him seven goals and 15 points in 42 games. The Red Wings hope that Trevor Daley is able to return this weekend as he has been out since December 29 with a broken foot. The Oilers are on the road this week and play three games in four nights. They will go with the hot hand in net with Mikko Koskinen and Cam Talbot but neither have been even close to hot of late. Talbot gave up one goal on 36 shots Thursday so he should be in line for a couple of starts. The Oilers are a bad team right now but that has not affected the play of Connor McDavid who has 80 points in 53 games, one point behind Nikita Kucherov of the Tampa Bay Lightning for the NHL scoring lead. Leon Draisaitl has 31 goals and that’s a new career high. Andrej Sekera has been sent to the AHL on a conditioning stint as he has been out all season following an off-season torn Achilles injury. Derick Brassard has started his Florida career alongside Mike Hoffman and Vincent Trocheck. The Panthers picked up Brassard and Riley Sheahan from the Penguins for Nick Bjugstad and Jared McCann. Jonathan Huberdeau has a team-best 51 points but a team-worst minus-23. Micheal Haley led the NHL in penalty minutes last season with 212 but has only 30 this season in 22 games this season. There has not been a lot to differentiate Roberto Luongo and James Reimer in goal this season as Luongo has a 11-12-1 mark with a 3.11 GAA and a .897 save percentage while Reimer is 10-9-5 with a 3.06 GAA and a .901 save percentage. You have to wonder if Sergei Bobrovsky would be of interest to the Panthers. Adrian Kempe has goals in each of his last three games after going the previous 19 with nary a goal. Dion Phaneuf had been a very good defenseman in his NHL career but this year has been a bad one for the 33-year-old who has only one goal and three points in 46 games. He was a healthy scratch on Thursday despite scoring his lone goal of the season Thursday. Jeff Carter has missed the last two games with a lower-body injury and could miss this upcoming week as well. Anze Kopitar saw his five-game points streak end on Thursday but had three goals and nine points in the five games. He is up to 40 points in 53 games and leads the lowly Kings in scoring. The Wild get a huge break this week as in all three of their games they are the rested team. Mikko Koivu is out for the remainder of the season as he tore up his knee and will undergo surgery. Charlie Coyle could be replacing him at center and the Wild also recalled Joel Eriksson Ek. Ryan Suter has nine points in his last 11 games. Zach Parise leads the Wild in goals with 21 as well as points with 46, two better in the points department than Mikael Granlund. Nick Seeler is the team leader in penalty minutes with 41. Devan Dubnyk has a 20-18-4 record with a 2.60 GAA and a .912 save percentage. The Wild have given up 11 empty net goals. The Canadiens are on the road for all three games this week which they play in four nights. Carey Price should get a pair of starts with Antti Niemi getting one start. Price has been great this season as he is 23-13-4 with a 2.52 GAA and a .916 save percentage. Price has won his last seven starts in a row and are tied with the Islanders at 68 points, seventh best in the NHL. Jonathan Drouin had a pair of goals and four points Thursday to give him 46 points in 55 games. Tomas Tatar is playing with Matthew Peca and Max Domi on the second line as he has 16 goals and 39 points in 54 games with a plus-10 rating. Andrew Shaw is close to returning as he is out with a neck injury. He has yet to play in 2019, a span of 15 games. The Predators made a couple of trades this week as they picked up Brian Boyle from the Devils in exchange for the Preds second round pick in 2019 and then dealt for former Nashville tough guy Cody McLeod, giving the Rangers their seventh pick. Boyle and McLeod both add toughness but Boyle is also a scorer, with 13 goals in 47 games thus far, something the Predators could use. There are only four Predators who have more than 13 goals as Viktor Arvidsson has 22, Filip Forsberg has 19, Craig Smith is sitting at 16 while Nick Bonino has 14. Nashville scored on the power play Tuesday, snapping a 0-34 slump. Kyle Turris returned to action on Thursday after missing 17 games with a lower-body injury. Roman Josi has three goals and eight points in seven games. The Devils play all four games this week including three games in four nights. Expect to see Keith Kinkaid and Cory Schneider share the net. The Devils sent Mackenzie Blackwood to the minors even though he has been the much better goalkeeper this season. Schneider returned to the lineup and while he lost in a shootout, he gave up only one goal on 28 shots. He has not won in regular season action since December 27, 2017 and is 0-5-2 this season with a 4.11 GAA and a .866 save percentage. Miles Wood suffered an apparent arm injury Thursday. Pavel Zacha had no points through his first 12 games this season but has nine goals in the 36 games since then including two on the power play and a couple of shorthanded efforts. Andrew Ladd partook in the Islanders optional skate Thursday as it looks like he will be back in the lineup shortly. He has been out of action for 36 games with a lower-body injury and has three goals and seven points in 14 games. Anthony Beauvillier has been moved back down to the third line after seeing action on the first unit with Mathew Barzal. He was replaced on the top line Thursday by Michael Dal Colle who also played alongside Josh Bailey. Nick Leddy was a NHL-worst minus-42 last season but has improved significantly this season with a minus-one rating. He is minus-four over the last two games. Scott Mayfield leads the Islanders in penalty minutes with 46, five better than Anders Lee. Mika Zibanejad and Mats Zuccarello have been sensational of late as Zibanejad has 10 goals and 18 points in his last 10 games while Zuccarello has five goals and 14 points in his last nine contests. The Z boys have been carrying the Rangers but that could end soon as Zuccarello should be dealt by the trade deadline as he is a pending UFA. Another UFA-to-be is Kevin Hayes who has 12 goals and 37 points in 44 games including two goals and four points in five games since returning from an upper-body injury that cost him nine games. Keep an eye on Filip Chytil who has 10 goals and 19 points. He is only 19 and won’t turn 20 until September. Neal Pionk was a healthy scratch Wednesday as he has struggled since returning from a lower-body injury that cost him four games. Mikkel Boedker is out week-to-week after suffering a middle-body injury. Craig Anderson has yet to win in four starts since returning from a concussion on January 19. He is 14-17-3 with a 3.55 GAA and a .904 save percentage for the lowly Senators. Ottawa needs to sign Matt Duchene and Mark Stone to contract extensions before the trade deadline or else they will have to be dealt elsewhere as the Senators have to get something in return for their assets. Magnus Paajarvi scored twice for Ottawa against the Maple Leafs to give him seven goals this season. He has not hit double-digits in goals since his rookie season when he had 15 with Edmonton who drafted him 10th overall in 2009. Maxime Lajoie got off to a great start with four goals and seven points in his first six games but the rookie defenseman has only three goals and eight points in 43 games since then. The Flyers play a pair of back-to-back games this week and while it is likely that Carter Hart and Anthony Stolarz split the net, it could be the red-hot Hart that gets three starts. Philadelphia also plays a home-and-home series with Detroit so look for Wayne Simmonds and/or Radko Gudas to get involved in some fisticuffs if tempers flare. Philadelphia saw its eight-game winning streak come to an end on Thursday when they lost to the Kings in a shootout but still managed a point. The Flyers sent Jori Lehtera to the minors after he cleared waivers Thursday. He was part of the deal that sent Brayden Schenn to the St. Louis Blues. Fortunately, the Flyers also received a first round pick in the trade and they selected the highly-regarded Morgan Frost with the pick. The Penguins play four games this week but not three games in four nights. Expect to see Matt Murray (if healthy) in goal three times with the struggling Casey DeSmith getting one start. DeSmith has given up 16 goals in his last four starts. Murray suffered an upper-body injury that forced him to sit out on Thursday but the Penguins are hoping he is okay to return this week. Pittsburgh picked up Nick Bjugstad and Jared McCann from Florida this past week. The Penguins played Florida Thursday and McCann scored against his former teammates in a loss. Bjugstad is seeing time on the first unit with Sidney Crosby and Jake Guentzel. Guentzel reached the 50-point mark for the first time in his career. Kris Letang is having a great season with 12 goals and 46 points in 52 games. Evgeni Malkin has missed the last four games due to an upper-body injury. The Blues play four games this week including three games in four nights. Expect to see Jordan Binnington play three times and Jake Allen once this week as Binnington has started the last six games. Binnington has been great thus far as he is 8-1-1 with a 1.70 GAA and a .931 save percentage after shutting out the Lightning 1-0 in overtime Thursday. David Perron may be back this week as he is out with an upper-body injury and is not expected to play on the weekend. Carl Gunnarsson had three goals and seven points in nine games before missing Thursday’s contest with an upper-body injury. The Blues have been hot lately with four straight wins and have moved into the second wild card spot with 55 points. The Sharks play Vancouver twice this week. The Canucks have some toughness on their team in Antoine Roussel and Erik Gudbranson so if there is anything in the way of fighting, look for Evander Kane to take matters into his own hands. Erik Karlsson has missed six straight games with a lower-body injury but could return this week. Martin Jones has won four games in a row and is 26-10-4 this season but his peripherals are nothing special with a 2.90 GAA and a .899 save percentage. Evander Kane had two goals and an assist Thursday and has 25 points in his last 20 tilts. Brent Burns leads all defensemen with 61 points in 55 games and has a five-game points streak going with two goals and nine points. Brayden Point has 31 goals and 66 points but has only one goal and no assists in his last four games. It’s been a tough week win-wise as he gave up three goals in his last two games and didn’t get the W in either one as he lost in overtime 1-0 to St. Louis and lost 3-2 in a shootout to Vegas. Congratulations to Erik Cernak who scored his first NHL goal of his career Saturday. Nikita Kucherov has seen his lead in the NHL scoring race shrink to one point as he has 81 to Connor McDavid’s 80. Ryan McDonagh has been solid this season with five goals and 28 points as well as a plus-19 rating. Yanni Gourde has been a disappointment with only 13 goals and 31 points in 54 games after a 64-point campaign last season that included 25 goals and a plus-34 rating. The Maple Leafs head out to the American West with road games against Colorado, Vegas and Arizona. They are back on track as they have won three straight and have 69 points, second best in the East. As noted at the top, the big news was the contract extension given to Auston Matthews. Congratulations to Jake Muzzin who played in his 500th NHL game on Wednesday. That’s 496 with the Kings and four with Toronto. Zach Hyman is on a bit of a scoring streak with five points in his last three games. William Nylander has a goal and six points in his last six games. Andreas Johnsson has three goals and five points in his last two games. After a poor start to the season in which he had two goals and an assist in his first 18 games, he has 11 goals and 24 points in his last 31 contests. Vancouver plays four games this week including three games in four nights so look for Jacob Markstrom to play three times. Thatcher Demko will miss this week as he is out with a knee injury. Michael DePietro, the best goalie in junior hockey, was recalled as an emergency replacement and could make his NHL debut this week. Alexander Edler is out of action with a concussion that could prevent the pending UFA from being traded by the February 25 deadline. Josh Leivo has two goals and six points in his last seven games after a three-point performance Thursday. Elias Pettersson has a plus-15 rating, the best on the Canucks while Erik Gudbranson is a team-worst minus-19. The Golden Knights have won two in a row but lost six of the previous eight games and are in third place in the Pacific Division, seven points behind Calgary and five points in arrears of San Jose. In a year where goal scoring is up, the Golden Knights are not having the best of time finding the back of the net as Jonathan Marchessault leads the team in goals with 19, two up on William Karlsson who had 43 goals last season. Nate Schmidt is a plus-13 since returning 36 games ago from his 20-game suspension. Marc-Andre Fleury won his league-leading 29th game of the season Thursday and has a 2.48 GAA and a .912 save percentage. Brandon Pirri has stopped scoring (no points in his last six games) and was a healthy scratch Thursday. William Carrier (undisclosed) has started practicing and should return to the lineup shortly. He has been out of action the last five weeks. The Capitals play four games this week including three games in four nights so look for Braden Holtby to play three games with Pheonix Copley playing once. The Capitals hope to get Christian Djoos back in the lineup this weekend as he has been out of action for the last two dozen games with a leg injury. Alex Ovechkin set a record this week as he became the highest scoring Russian in NHL history. He picked up his 1,180th point, surpassing the great Sergei Federov in 193 less games than the former Red Wing. Ovechkin leads the NHL in goals with 37 and has 60 points. Andre Burakovsky has seen his name bandied about in trade rumors and it could be a long two-and-a-half weeks for the winger. John Carlson is having a great season with eight goals and 49 points in 53 games. He is also a plus-17. The Jets lost Josh Morrissey for Thursday’s game after he blocked a shot on Tuesday. He is expected back Saturday. Morrissey has six goals and 29 points this season in 51 games. Dustin Byfuglien returned to action Thursday after missing 15 games with a lower-body injury. The injury may be a good thing for the Jets as they are expected to make a deep run in the playoffs and will get a refreshed Byfuglien who won’t be worn down by the long NHL season. He has four goals and 29 points in 33 games with 52 penalty minutes. Jack Roslovic had five goals last week, all on the power play and for that he was named the first star of the week in the NHL.